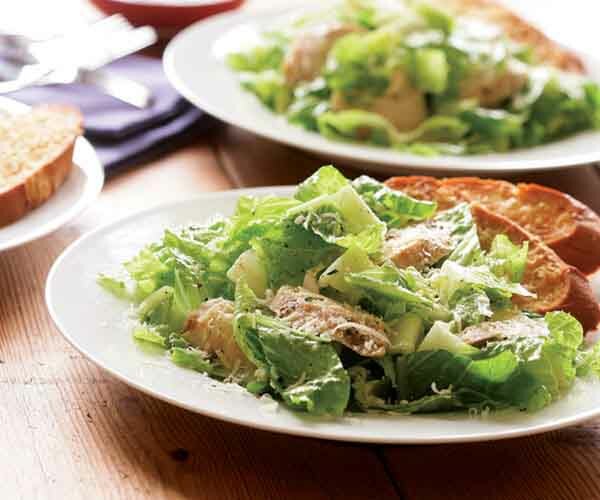 This take on Caesar salad is lighter and brighter than most. Lemon juice and zest punch up the vinaigrette, while a little mascarpone, instead of the traditional raw egg yolks, imparts richness. 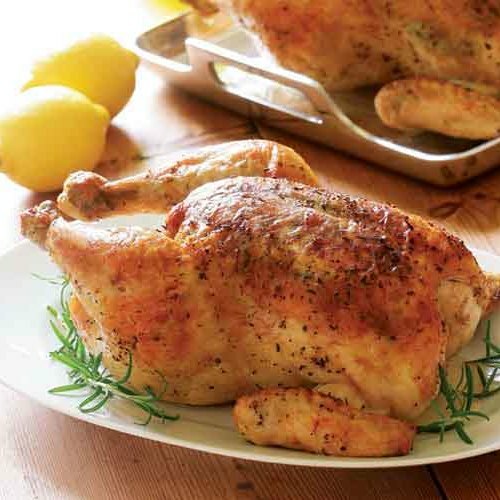 If you don’t have leftover roast chicken you can also use a store-bought rotisserie chicken. Finely grate about 1 Tbs. zest from the lemon. Squeeze the lemon to get 2 Tbs. juice. In a blender or mini chopper, purée (as much as possible) the lemon juice, Parmigiano, mascarpone, mustard, garlic, and Worcestershire sauce, scraping the sides as needed. While puréeing, drizzle in the oil, slowly at first and then in a more steady stream as the mixture thickens and emulsifies. Thin the vinaigrette with water if needed. Add the lemon zest, thyme, and Tabasco and purée. Taste and season generously with salt and pepper (about 1 tsp. of each) and more lemon juice if you like. Heat the oven to 425°F. In a small bowl, mix the oil, garlic, and red pepper flakes. Set the baguette slices on a baking sheet and brush them with the oil mixture. Sprinkle with 1/4 cup of the Parmigiano. Bake until browned, 10 to 12 min. In a small bowl, toss the chicken with about 1/4 cup of the dressing. In a large bowl, toss the romaine and 1/4 cup of the Parmigiano with enough dressing to coat lightly (you might not need it all). Add salt and pepper to taste. Put the dressed greens on plates and top with the chicken and a drizzle of dressing, if any remains. Sprinkle with the remaining 1/4 cup Parmigiano and some black pepper and serve immediately with the toasts. Serve a quick and easy Lemon Parfait for dessert. Best Caesar dressing recipe I've ever made. Quite tasty! I grilled chicken chicken breasts using a previous FC recipe that marinates chicken in Dijon &amp; mayo and the flavors all went together perfectly. My husband loved it! The dressing is fabulous. I had chicken breast to grill so my salad was more work. This reminded me why I don't make a caesar very often. There is a lot of time that goes into the dressing and croutons, which are necessary for a true home made caesar. Thankfully I have plenty for lunch today. Don't skip the lemon zest I think it makes the dressing! I love this caesar recipe. I omit the lemon zest because I think its lemony enough, but if you like lemon a lot the zest can be nice too. I really like that this is a creamy caesar dressing with no egg or anchovy, but has that great caesar taste! This dressing is an easy favorite.